In a tight start to what's expected to be a tight series, the Penguins had no answer for T.J. Oshie as the winger netted a hat trick in powering the Capitals to a 4-3 overtime win in Game 1. It was an up and down night for Matt Murray, who at times looked like a polished veteran and others like the 21-year-old netminder he is. Murray finished with 31 saves on 35 shots, but it wasn't enough to give the Pens the W. Ben Lovejoy, Nick Bonino, and Evgeni Malkin scored for Pittsburgh, and they'll return to the ice Saturday hoping to steal home ice away from Washington and avoid heading home in a 0-2 hole. The Penguins got early sustained pressure in the Washington zone, first with the Crosby line then with the Malkin line winning the faceoff and Chris Kunitz ringing a shot off the post. It would be a fast paced start to the game in Pittsburgh's favor, but a Matt Cullen tripping penalty on Evgeny Kuznetsov would send the Capitals' power play onto the ice for the first time in the series. Washington showed why they have one of the most feared units in the league, and they generated several good scoring chances with the man advantage, but Matt Murray was the team's best penalty killer and was excellent in making sure to turn the Caps aside. 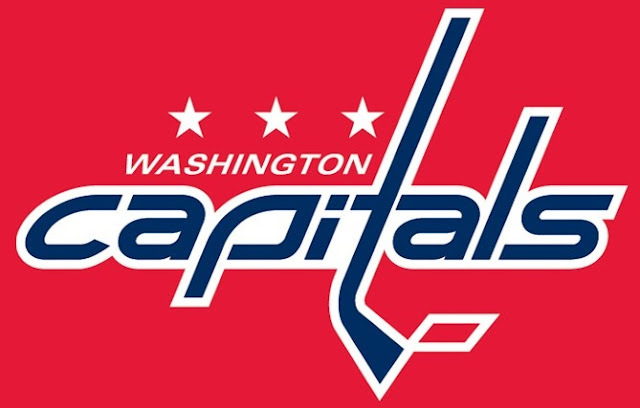 It would just be delaying the inevitable, as the ice started to tilt in Washington's favor, and they managed to open the scoring midway through the 1st period. Jason Chimera would put a shot on net through traffic on an odd-man rush, and Murray would leave the rebound right off the crease where an uncovered Andre Burakovsky was able to put it home as Brian Dumoulin wiped out in front of the net and made it difficult for his goaltender to recover. Washington would continue to carry play until Burakovsky was whistled for boarding Matt Cullen with 5 minutes left in the period, sending the Penguins to the power play. Pittsburgh had a couple good looks, but like Murray at the other end Braden Holtby was able to snuff out the chances the Pens were able to generate. Pittsburgh would generate some pressure in the closing seconds of the period, but the teams would head to the locker room with the score 1-0 Capitals. The Pens would come out for the 2nd period and begin controlling play again, but a Kris Letang interference penalty against T.J. Oshie would put Washington back on the power play. This time, the Penguins' penalty kill would do a much better job preventing the Caps from getting much set up, and they'd kill off the opportunity without much difficulty. The Penguins would manage to pull even midway through the 2nd period after a great individual play by Nick Bonino. Bonino deked inside the blueline and got Nate Schmidt and Demitri Orlov to collide and take each other out, and after being stopped on the initial shot by Holtby, Ben Lovejoy crashed the net and shot in the rebound to make it 1-1. They wouldn't stop there, as 57 seconds later it was Evgeni Malkin jumping into the play off the bench and ripping a backhanded shot off Holtby's inside shoulder and off the far post and in to give Pittsburgh the shocking 2-1 lead. But that lead wouldn't last long either, as Oshie grabbed the puck in transition and beat Murray glove high from the right circle to pull the teams even again at 2-2. Moments later, Malkin and Tom Wilson would be sent to the box after Malkin crushed Wilson along the boards. Wilson would get called for cross checking, while Malkin picked up the penalty for embellishment. The teams would take the ice 4-on-4, but neither was able to take advantage of the extra ice and they'd return to 5-on-5. They'd take the 2-2 score into the second intermission, and both teams would start the 3rd period looking to get the go ahead goal. It would be Oshie adding his second of the game minutes into the third period when he grabbed a loose puck and slipped it five hole on Murray. Moments after the goal, Tom Wilson would ramp up the dirty play when he gave Conor Sheary a late knee-on-knee hit in the neutral zone, but it went unnoticed by the refs. Pittsburgh would get a call not long after when Kuznetsov was sent off for hooking Malkin, but it was short-lived after Phil Kessel was sent off for tripping 14 seconds later when Jay Beagle's stride caught Kessel's stick in the blade of his skate. 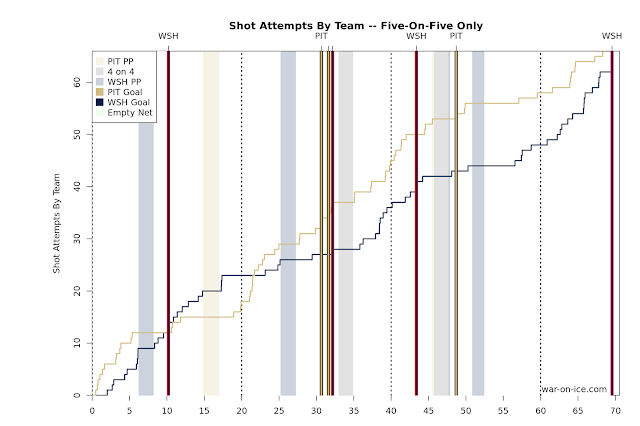 Pittsburgh would get a couple chances on the ensuing 4-on-4, and while they wouldn't convert it seemed to be only a matter of time against a Capitals team that was only playing with 5 defensemen. And they'd get the equalizer midway through the 3rd period when Nick Bonino took a Carl Hagelin in the slot and had his shot deflected by the Washington defender past Holtby. In what can only be described as calling penalties by a roulette wheel, Conor Sheary was ridden into the boards nowhere near the puck with no call only to see a questionable penalty on the other end after Lovejoy stepped up on Burakovsky in front of the net. 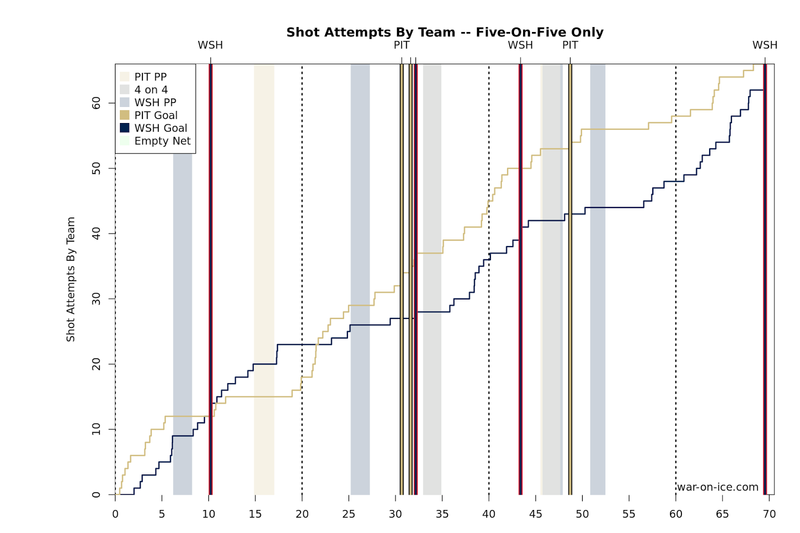 Pittsburgh would do a great job killing off the first half of the penalty in the Washington zone, and the Capitals would nearly get the go ahead goal after gaining the zone when a Matt Niskanen shot hit the post and laid in the crease before getting swept aside. Ovechkin would get another breakaway with three and a half minutes remaining in regulation, but Murray made a great play to get his right pad out and deny the Russian sniper. The clock would run out on the 3rd period with the score still tied 3-3, and the teams would head to sudden death overtime to declare a winner. And it would be all Capitals to start the overtime period as Washington was able to hem the Penguins deep in their own zone for much of the early action. The Pens would be able to withstand the pressure, and the two teams would play back and forth hockey until T.J. Oshie scored his third goal of the game on a wraparound that just trickled across the goal line. The play would be reviewed, and while at first the reviews seemed to show the puck staying out the definitive view from the left boards clearly showed the puck crossing the line. The Penguins got off to a fast start before watching the Capitals roar back, but Pittsburgh would begin to pull ahead in possession starting with the 2nd period and ended the night with a scored-adjusted 51.3 CF%. It was a bit of a sloppy game for both teams, but there was enough for both sides to take away from the game to think that they can win this series. The Pens will need to make sure they're not blowing assignments in the defensive zone or turning the puck over in a vulnerable position. They'll get a chance to try for a better outcome Saturday night in Game 2.